Under Archdiocesan guidelines for financial considerations, the optimum number of students per classroom is 35. The required age for pre-kindergarten students is five 4 years of age on or before September 1. The required age for kindergarten students is five 5 years of age on or before September 1. The required age for first grade students is six 6 years of age on or before September 1, (unless waived by the principal). The parish school will strive to have Catholic education accessible to as many students as possible, both with its educational programs and financial considerations; however, it may have insufficient resources to meet the educational and financial needs of all students. 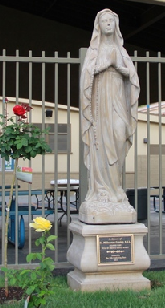 ADMISSIONS POLICY As a Catholic religious-oriented school founded for Holy Name of Mary Catholic Church/Parish, we give preference to members of Holy Name of Mary Parish and to members of other Catholic parishes. Once our Catholic applicants have been served, we welcome students of other religions. Holy Name of Mary School is not geared to accommodate students who demonstrate severe grade level deficiencies or behavioral problems. We do all in our power to recommend and/or schedule specialized testing where academic deficiencies may be caused by specific learning disabilities, and will assist in referrals for alternate school placement where necessary. To ensure proper grade placement new students entering Pre-Kindergarten, Kindergarten and Grade 1 are administered a Readiness and Maturity Screening Test. Students in Grades 2-8 are administered an achievement battery composed of tests in several subject areas. 1. Application screening and test results. 2. Children whose parents are registered and active in our parish. 3. Children who have other siblings attending our school and are registered. 4. Children who have other siblings attending our school. 5. Children of new parishioners whose parents were registered and active in their former parish. 6. Out-of-parish children whose parents are active in their parish of attendance.